I see you are editing around the ________ area. Thanks for helping. I would like to welcome you to editing and offer you to join other editors in Ohio. We communicate in Google Hang Outs (GHO)s and share tips, news and tools that make editing and asking for down-locks easier. If you would like to pursue joining with us, just read this below page and click the link on it to join. New editors should familiarize themselves with the Ohio Wiki before doing very much editing. Please read about edits to avoid. New editors should be aware there are many scripts and extensions that editors use to assist with editing and not only make some jobs easier but verifies what we do is correct. The use of these scripts is highly encouraged and should be a minimum to get started. The most common and supported browser is Chrome with Firefox a close second. If you are using Chrome the scripts are managed by TamperMonkey. If you are using Firefox they are managed by GreaseMonkey. Which ever one of these is appropriate should be installed prior to the scripts. The first two are extensions in Chrome at least, I don't know about Firefox. Toolbox also loads a toolbar that is usually at the bottom but it is moveable, place it where you want. Toolbox also shortens the Permalink or PL, for better usage when requesting down-locks and up-locks. To enable this, goto the toolbar and select the Wrench Icon (tools), then scroll to the bottom and select "Reset WME Layers settings" and select the OK button. Then refresh your screen by selecting the chain links in the bottom right corner. The chain links also give you the PermaLink (PL) info. This will validate edits and other general best practices of the map. These are Ohio Specific and the Ohio Localization runs with Validator for our lock levels and other differences, FC and more. This script shows which is the closest segment for a place to snap to. To request a Lock Change in the GHO, State the level coming from and going to and then state the area it is in by naming the closest city. Next would be your reason, why are you requesting the lock level to change and lastly be polite. A please and thank you go a long way. Paste the PL starting on its own line. You can select multiple segments in one PL by selecting the first one, holding down the CTRL key and selecting the others. You can goto a new line in the GHO by holding the Shift Key and then hitting Return, without sending the message. Can I please have L3 > L1, Dayton area, to change turn restrictions to match local signage. Insert PL here and on a new line. 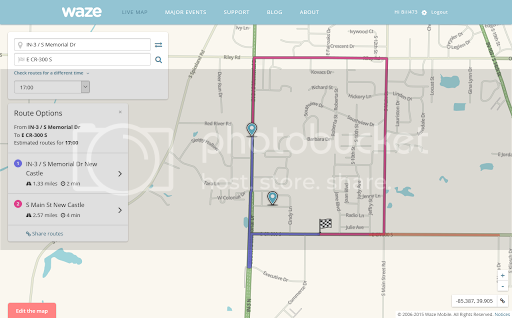 Can I please have L1 > L3, Dayton area, finished with turn restrictions, please review and lock when satisfied. The following was originally presented by Bill473 as a training aid to satisfy the BDP requirement to attain R4 rank for both of us. Bill has made changes based on feedback from PesachZ and TerryPurdue but remains responsible for any errors or omissions. If you have suggestions to make this better, please contact either Ron or Bill. 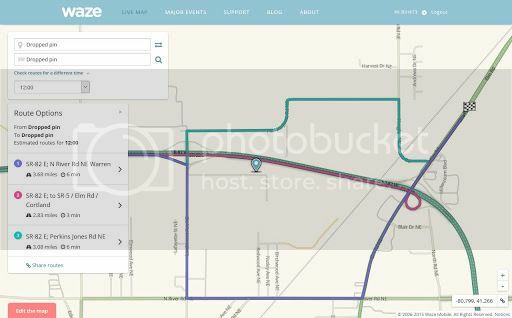 This is an introduction to how Waze does detour prevention, how it can go wrong and how to fix it. First, detour prevention is a good thing. You don't want Waze to recommend getting off an interstate, following some ramps and getting back on even if it saves a few minutes. That is an unneeded detour and Waze has mechanisms to prevent it. When Waze editors discuss BDP, what they are focusing on is Big Detour Prevention errors – where the attempt to prevent detours goes wrong and actually takes you on a detour. When checking BDP errors, you need to look at primary and alternate names on segments. A very useful user script is WME Show Alt Names. It shows the names of all selected segments in a table on the edit page. And it can be turned off and on as needed. You can use it to select the segments for a LiveMap route or you can select them yourself. I list this now in case you don't have it and want to install it while I continue. I don't have an "exercise" planned where you need it, but it will make diagnosing BDP errors easier in the future. And here's the LiveMap link to the area so you can see where the segments are. The "obvious" way to get to the destination is possible. Going northbound, take the exit and drive down to the bow-tie on US-36 W. Turn left and drive to the destination. So why didn't Waze recommend that? Because it thought that would be a detour! Let me try to explain the "detour" before getting into all the details. US-127 N has an alternate name of US-36 E (because both highways share the road before the exit.) Our destination is on US-36 E. Once we leave the freeway, we are taking 2 ramp segments to get to US-36 E. Neither (at the time) have the (primary or alternate) name US-36 E.
If we are OK with my description here, we can take a look at the Wiki to see that the exact definition is met. The global Wiki entry on Detour Prevention is Detour Prevention Mechanisms, however is it rather vague, and partially inaccurate leading to confusion. Yes: US-127 N is Freeway, US-36 E is MH so same group. Our ramp "detour" isn't in that group. Existence Of Direct Route - The idea is there needs to be a direct route before labeling a different route as a "detour" to be avoided. The " direct route" doesn't need to be "direct", it just needs be a different route which does not use any segments used by the "detour route" being evaluated. The "direct route" here is not the route Waze is suggesting, rather a different more circuitous option. Yes: Threshold for this group is 5km. Whew! Let's take a breath. The complexity of the Waze routing algorithm and the difficulty in putting it into words is why (I think) some view BDP as very hard to understand. Here is the basic idea that I think makes this "simple". You have 2 highways (A and B) running together for some distance. The highways then diverge with B exiting on ramps. 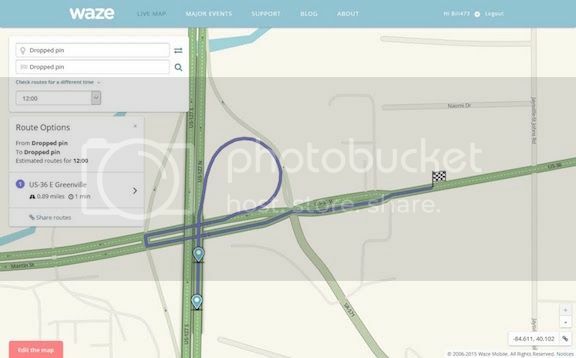 If the ramp segments aren't labeled to indicate they are part of highway B, Waze will see that as a detour and "penalize" the way you should be driving...which results in Waze recommending a strange detour. So what's the fix? Let Waze know that this ramp is part of US-36 E. Adding US-36 E as an alternate name to the second ramp segment was sufficient to fix the problem. A more robust solution is to add US-36 E to all ramp segments that carry that route. At one point we believed you could have a one-segment name discontinuity anywhere along a series of ramp segments. We discovered Nov 2015 that the only safe place to have a discontinuity was the first segment. However, unless there is a reason to leave the name off the first segment, it is safer to add it. Here's the LiveMap link to the area so you can see where the segments are. I-80 (E/W) and I-35 (N/S) run concurrently for a while near the center of Des Moines. Where I-35 N leaves I-80 E and heads north was connected by a single ramp segment. Everything was OK at that point because of #4 above ("detours" must be 2 or more segments). It was then cut to Seagull it. Now we have 3 segments and I-35 N was not added as an alternate to the new ramp segments. Within a few days there were numerous URs from commuters wondering why they were no longer being sent the normal way. The Des Moines error was fixed by adding I-35 N as an alternate to the ramp segments. Although currently only the last of the three segments is checked for BDP (probably to make checking faster), PesachZ suggests that is likely to change. The best fix is to have I-35 N on all. Indeed, if that single ramp segment had I-35 N added earlier, even though not required to prevent a BDP error (since 2 ramp segments required for BDP here), when it was cut into 3 segments no BDP error would have occurred. It's very easy to cause a BDP problem in a case like this without realizing it. Think "name discontinuity" any time you are working on ramps. As more Seagulling in being done, it's likely other such errors will occur. Again, the most dangerous areas are where two major highways diverge. Are we OK with the Des Moines example and fix? The obvious path is still listed, but listed second so it won't be chosen by default. (Again, the problem is caused by 2 ramp segments, the second one didn't have SR-5 for name continuity.) The recommended route is 6 minutes, the second (penalized) one is 3 minutes. But the penalty (not publicly revealed, changeable without notice and possibly different for different configurations) is enough to make it listed second. Also, depending on traffic conditions for the first choice, the second route with the BDP error could actually be listed first so BDP errors could (theoretically) come and go. I have other examples of BDP errors I've seen in the last year, but they are all the same flavor. When you see a strange detour, after checking Shift-Z to make sure there aren't invalid turn restrictions, take a look at name discontinuities. If we're OK with BDP, there is also there is also Small Detour Prevention. This is discussed much less because there doesn't seem to be the same type of associated errors. Basically this is meant to prevent doing a U-turn followed by a right turn instead of the more obvious left turn. From the Wiki "While this may save a few seconds over waiting for a long average left turn, it is undesirable. Waze will prevent such detours if there is not a measurable difference in the route times. The exact difference in time required to trigger this prevention is proprietary, and subject to change as needed. " Here is an example where Small Detour Prevention doesn't seen to be working. It seems that at certain times of the day, the obvious left-turn takes long enough for Waze to recommend continuing and doing a U-turn. Here's the LiveMap link to the area. This page was last modified on 15 December 2016, at 15:40.